The Antari, or travelers, are the only ones that possess the power to travel from one London to the next. Kell services his king and queen by doing exactly that, travelling, but he cannot withstand the urge to bring trinkets from one world to the other. Even though this is extremely forbidden.. and soon, Kell finds out why. He is joined by a girl from Grey London, who is eager for adventure. Her name is Lila, and the both of them create a fun set of protagonists. Lila has built a thick shell around her, she is morally grey and straightforward. Sometimes infuriating, mostly absolutely loveable. Kell, on the other hand, is a bit quirky. He wears a coat with many different sides, turning it inside and out, depending on what he wants to wear. Complex, layered, unique and imaginative, just like his character. He managed to charm me, without even trying. They are not the only characters that made an impression. I actually cannot think of one character that I wasn’t interested in. Everyone had their own, selfish reasons for using or abusing magic. Their own motives, and so I was left feeling sorry for something harmful happening, even to one of the bad guys. I was quickly sold by the world shown by V.E. Schwab, or well, worlds. Each had their own unique characteristics, though remaining interesting throughout. She somehow writes so expressively, breathing life into each one, bringing both beauty and ugliness to the table. Because this book is not necessarily for the faint of heart. There are some darker elements to this otherwise beautiful, intriguing tale. Though, and I’m sure I’m not the only one, I fully see a ‘plot twist’ in part two coming, I never noticed any other form of predictability in the plot. I never once had a chance to feel something coming, because I was so captivated by everything else, preventing me from ever feeling bored. 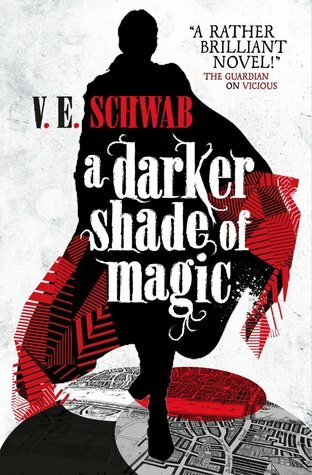 A Darker Shade of Magic has shamefully sat on my shelf for a while now, and my wish list longer, but I am terribly glad I finally picked it up. A very fluid, fast paced but elegant fantasy novel. As Travars, to travel, to the bookstore where I will soon pick up the next! You absolutely must! I went through the books in the snap of a finger. They’re so addictive, haha. Who’s your favorite character? I am so sorry for replying this much later! Me and my friend are working on getting the blog running again; we’ve just been so busy! Anyhow, to answer your question.. I think Kell, he is very intriguing and I want to find out more about him! Lila however has very quickly stolen a place in my heart. How about you?